On behalf of the entire Paizo Publishing family, thanks for your continued support of our company in the form of your subscriptions to Dragon and Dungeon magazines. It's been an honor to publish these historic publications for the last five years, and we appreciate your role in making these magazines creatively and financially successful. As you have learned, Wizards of the Coast has decided not to renew Paizo's license to publish Dragon and Dungeon, and plans to provide similar content in an online capacity. Both Dragon and Dungeon ceased print publication following the September issues (Dragon #359 and Dungeon #150, respectively). 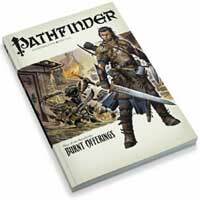 Pathfinder is a new monthly 96-page perfect-bound, OGL-compatible, full-color softcover Adventure Path book printed on high-quality paper for use with the world's most popular roleplaying game. The 12-time ENnie Award-winning editorial staff that brought you Dragon and Dungeon have designed the next evolution in RPG campaigns, and we're sure current readers will love what we have in store in the new Rise of the Runelords Adventure Path. Current subscribers can transfer their existing excess subscription credit to monthly volumes of Pathfinder at a generous discount as an easy way to try out the new publication. This is your chance to get in on the ground floor of this major new series, and we'd certainly love the chance to keep delivering exciting gaming content to you on a monthly basis. Learn much more about Pathfinder at paizo.com/pathfinder! If you check the "Start my month-to-month subscription" box, you'll be able to set up an ongoing subscription that automatically continues after your conversion credit runs out. Subscribers can choose to receive select back issues of Dragon or Dungeon on a one-for-one basis based on remaining subscription credit. This is a great way to fill holes in your collection. Once Paizo runs out of these magazines, they'll be gone for good. The following grid shows your excess subscription credit and an overview of how the above options stack up to help you make an informed choice. Please note that you must be signed in to your paizo.com account in order to view this breakdown.